The illustration demonstrates how an RPG program on your IBM i can “call” a web service that resides on another machine. The RPG program composes and passes an XML stream from the remote web service on the Server/Client and receives back the response XML which it parses for its data contents. For example, the RPG program could send an XML invoice to a business partner to automate the billing process, or a purchase order could be sent to a supplier to automate the shipping of widgets to your company. The illustration demonstrates RPG-XML Suite playing the opposite role. 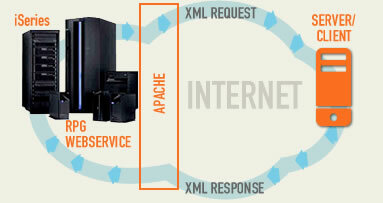 In this case, the Server/Client calls RPG-XML Suite by passing an XML request. The RPG Web Service running under Apache receives and parses the XML. Once the RPG Web Service program makes the data from the XML document available, other RPG business logic can be called or simply store the information to the DB2/400 database. 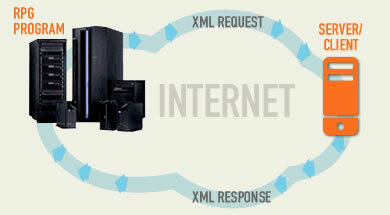 The RPG Web Service program can then compose an XML response and return it to the caller (Server/Client). RPG-XML Suite is the right choice and proven alternative to move your IBM i into the Service Oriented Architecture arena.